You know that OREO is America’s favorite cookie, right!? There’s nothing better than sharing it with with people, except when it is crushed and rolled up into the delicious, simple goodness that is the OREO Cookie Ball. Since the recipe that only calls for three ingredients, the options are virtually endless. I decided I wanted to create a gorgeous “holiday” way to display these little Oreo balls of deliciousness. I am having a holiday craft night with some friends this weekend and this will be the perfect dessert worthy of ooh’ing and awe’ing! 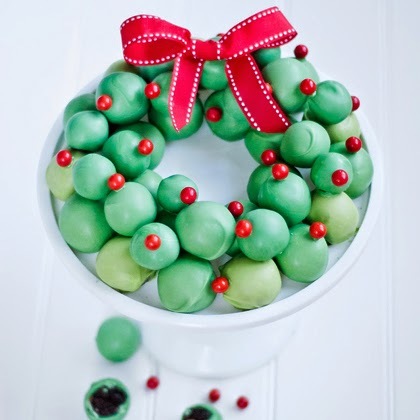 I decided to use my favorite Milk Glass Cake Stand to bring to the the event, and came up with a super cute and easy way to display the OREO Balls into a wreath!